Science Objects are two hour on-line interactive inquiry-based content modules that help teachers better understand the science content they teach.This Science Object, co-developed between NASA and NSTA, is the last of four Science Objects in the Earth, Sun, and Moon SciPack. It provides an understanding of why we have different seasons on Earth and why seasons vary from one location on Earth and another. The Sun is the major source of energy for phenomena on Earth’s surface. The seasons are caused by the tilt of Earth’s axis with respect to the plane of its orbit around the Sun. Because the angle and direction of tilt does not change as Earth orbits the Sun, during half of the year the north polar region tilts toward the Sun, resulting in increased heating (summer) and away from the Sun during the other half of the year, resulting in cooling (winter). The seasons are reversed in the Southern Hemisphere. This science topic is one that I fine great interest in. The article states that even though most people in the United States experience four different season including spring, summer, fall, and winter. The fall and spring seasons are very short and mostly absent because their winter is so warm. The article gives a great understanding of why we have different seasons on Earth and why seasons vary from one location on Earth and another. The seasons are caused by the tilt of Earth’s axis with respect to the plane of its orbit around the Sun. The angle and direction of tilt does not change as Earth orbits the Sun, during half of the year the north polar region tilts toward the Sun, resulting in increased heating (summer) and away from the Sun during the other half of the year, resulting in cooling (winter). This article I found to be very interesting due to the fact that it presents what causes the four seasons on Earth, and why are there regional differences in their length and characteristics. This is why I believe the article has merit. In the Earth's Seasons Science Object, students will investigate how the relative movements and positions of Earth and the Sun cause our seasons. This is stimulating and informative for students. The article has great visuals and I think will students will definitely understand and relate to the vocab words as they are able to visually see what the it really looks like. The info is relevant as it explains the common misconception about that the Earth being closer to the Sun in summer, as others are able to use the information? In conclusion, there are many things to be learned from this science object. I can definitely apply this lesson in my classroom and make it more relatable and adaptable to elementary students. It is an excellent resource, and does a good job of showing ways to address and correct student doubts about the seasons. I like the way how it explained the common misconception about that the Earth is closer to the Sun in summer. I really enjoy Science Objects. In 1-3 hours, the Earth, Sun, and Moon: Earth's Seasons Science Object will help me re-learn, refresh, or learn for the first time some critical science concepts I will have to know to obtain my Science Educator credentials. I appreciate that I can complete them at my own pace, and that, if used as park of a SciPack, I have access to a content expert to go to for help. The NSTA Learning Center Science Objects are really beneficial! Great short lesson. Simple Hands-on demonstration and good writing prompts for Checking your understanding. I enjoyed learning about the Earth's seasons. I liked this science object because you get quizzed as you go. I found this very informative and learned a lot about our Earth's seasons. I used this resource very successfully during my 2013 NASA Summer of Innovation summer school class! Loved the resource and the interactions! Also used in a Teacher Workshop prior to ALI'I! While reading, I realized that I had a lot of misconceptions stemming from elementary school at least. At the same time, however, I also realized that everything made more sense. During winter we are closer to the sun but there is less sunlight, which makes it colder. I learned many things and had many misconceptions changed from this science object. I thought this object was an excellent resource for information about the seasons. At first I hadn't been clear on what exactly caused the various seasons on Earth but this object presented the information in a clear way and I feel like I could more easily explain the concept to someone else now. It was also straight to the point without filler information which is great when you need a quick reminder lesson to refresh yourself. I thought this object was very helpful in explaining Earth's seasons. It was easy to navigate, had good explanations and useful vocabulary. The models were helpful and I especially liked that you can plot temperatures from different latitudes to visualize the differences in places during the year. Great object! This science object really helped me better understand why we have seasons on Earth. Before I had a vague idea, but now I can cite specifics. There are a ton of diagrams and visual aids that help you visualize what they are trying to explain throughout all of the sections. One of the videos, or animations as they call them, actually describes what is happening on the Earth as it orbits the Sun on its tilted axis. At each solstice and equinox, the video explains why certain hemispheres are or are not experiencing certain seasons at that time. A later activity compares the temperatures at certain places to their seasons and their location on the Earth’s surface in degrees latitude. Overall, I think this is a good resource for teachers and developing professionals because it provides a good overview of how the seasons on Earth work. I think that the Earth, Sum, and Moon: Earth's Seasons Science Object is structured in a way that is very helpful for teachers to learn. I really enjoyed going through it and learned a lot especially with the way it was structured. It is very cohesive and I really appreciated the use of audio to go along with the text. The illustrations are helpful to us visual learners and gave me a better understanding of the concepts being explained. I think that the mini quizzes at the end of each section are a great idea because it helps you focus on the topic that was explained. They also contributed to focusing on the important facts that would later be revisited on the final quiz at the end of the object. Overall two thumbs up! Wow! This ScienceObject was really helpful… I’m a little embarrassed to admit is but I guess I honestly didn’t know how the seasons work and had a few of the misconceptions mentioned in the presentation. I would definitely suggest this ScienceObject on how Earths seasons work. Who knew you could learn so much in under an hour? I feel like an expert on the season now and the information I have can be used across grade levels. This sci-object on the various seasons of the earth makes it far comprehensive for both educators and their learners to appreciate the changes that happen in the climate system of the earth. Comprised of very informative activities that help to explain the reason we have seasons on Earth. It elaborates on the solstices and the equinoxes, and provides interactivity to help the educator/scholar bridge the gap between the science being learned in the classroom and the real world. I especially like the way that common misconceptions are addressed, and the questions posed helps to extend one’s knowledge of how the Earth’s axis tilts (degrees), and of the results of said tilt in the Northern and Southern Hemispheres. This is a great visual activity that allows viewers to investigate how the relative movements and positions of Earth and the Sun cause our seasons. The science object highlights students’ fallacies, which allows teachers to then address common misconceptions as they work to help learners develop a deeper understanding of celestial phenomena. For example, the most common answer given for why it is warmer in summer than in winter is because “we are closer to the Sun in the summer than we are in the winter.” Through this activity, which includes models, diagrams, and illustrations, students can see that Earth is farther away from the Sun in June and July; thus stressing the fact that we receive less solar energy during those months. This makes it clear that Earth’s position in its orbit around the Sun does not determine when our seasons occur. The accompanying questions help to gauge the level of scholars’ understanding of the concepts. This is a great professional development tool for educators and scholars alike. I like the way this tells us in the beginning what we will be able to learn by the end. I really like the use of diagrams to show earth’s orbit around the sun. The terminology is a bit confusing so the visuals really help me make sense of this material. I feel like I really learned a lot from this. There is so much information. This is a great tool if a teacher feels like he or she does not know enough about a certain topic. I did notice that I was not picking up on some of the terminology quick enough and had to pause it so that I could reread. I like how it explains why it is hotter in the summer. The sun is lower in the sky during winter which causes winter. This is something I did not realize. I really appreciate the hands-on activity links. This helps teachers create an activity based on what they learned. This is very neat! 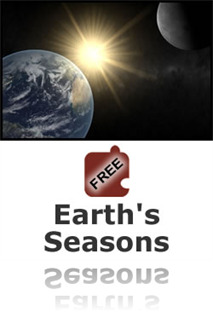 Earth, Sun, and Moon: Earth's Seasons, is a wonderful resource to look at. It is filled with a lot of information that teachers can use when they want to teach something very important about the Solar System. It is filled with picture and diagrams to really explain why the world goes through certain seasons. Right at the beginning of the resource, is lets you know what you will be able to do after reading the whole source. Therefore, you will not be disappointed about what you may or may not have heard at the end of it. The concept of seasons is one of the most difficult things for students to learn. It's not about distance from the Sun. You have to notice earth's orbit and rotation. This is shown in a lot of depth in the resource which teachers can show to their students. Overall, I loved this resource! This was great for a refresher. I think that this could be used pretty easily with older elementary school aged children to explain seasons. I think this is a very great resource. A topic of the seasons is important to learn. It is something that everyone goes through. It's very relatable to children. This is something I enjoyed learning and as a teacher it's a good thing if you enjoy it because then the students can as well. I really liked this resource! This interactive inquiry-based content module really helped me solidify in my head why the earth experiences 4 seasons. It is a common misconception that the reason the earth has summer and winter is because of the earth's rotation around the sun. That is not the case. This module makes it perfectly clear why seasons occur and how the sun’s energy plays a part in those seasons. A great resource! This one has great graphics that could deepen the knowledge of students. It has great diagrams. Great for PD!!! This is a very nice tool for elementary teachers. The tilt of the earth is a very hard concept to understand but this explains it very clearly in an easy to follow way. This is also true for the explanation of the amount of sun’s energy Earth receives during each season. It was all presented in a clear and straightforward way. Very useful information, time efficient and user friendly. This resource is a great way for teachers to become more familiar with the Solar System content, specifically related to the Earth, sun, and moon and how all three affect the seasons here on Earth. I really like the fact that this resource is listed as a science object on the NSTA Learning Center site, because this means teachers will receive a 2 hour inquiry-based module on the subject matter. Since the teachers will be presented with an inquiry-based learning of Earth's seasons, they will most likely be inspired to create an inquiry-based unit for their own Elementary students on Earth's seasons! I really liked this science object because I leaned many things. First I learned about lunar cycle because I did not know about it. I re-learned about the relationship between the sun, earth, and moon. I also enjoyed relearning about the earth's seasons. Now that I have read this, it will be better for me to teach this subject because the more you know about the content, the better you can teach it. I've always thought that because of the heat of the summertime that the sun was closest to the earth during the summer. I've learned something today! I think that this is a great resource because it will help teachers to learn how to better explain why the seasons change. I like that it starts out by explaining how the Earth orbits the sun. I think one of the hardest concepts to learn is how the earth orbits and how that affects the season. Students learn the season based on the months of the year so it is hard to break in the concept that really the seasons are caused by the Earth's orbit around the sun. The illustrations in this object are detailed and easy to understand. I like how it is broken down into sections with separate illustrations. This resource is highly informative. I would recommend this object for others. I loved the diagrams that were provided in this science object. I intend to explore the other science objects in this scipack. I also think the review questions are a great way to emphasize what students should be taking from the lesson. However, I think some of the terminology may be too complex for students at the low-elementary level. This may be a great resource for higher elementary, or perhaps a GT program. This was the first Science Object I have completed. Designed for Elementary school students, this resource can be viewed either as a text or listened to as if it was a lecture (has an audio recording of the full text). Either way, the text is accompanied by helpful visuals – models or illustrations. I appreciate that each section has at least one check point – a question with multiple choice answer for a learner to confirm his/her understanding. As other science objects, this one is also about two hours long when using narration. I was not able to do it in one session and had to return twice. I was surprised that I had to start from the beginning every time. This object has only eight pages and it was easy to skip the pages I had already completed but I think it would be better to be able to start where I left off. I found this article helpful for those of us who teach the seasons along with the understanding of Earth and what it encompasses. It clarified for teachers who would otherwise be unclear how the seasons are created and how the sun and moon and their rotations, tilt.... make the seasons change in the way that they do. For any teacher who is slightly familiar with the way Earth's seasons are created, this information probes deeper to assist in a stronger understanding for educators as well as the students. Fine Science Object. My only quibble is that the Earth's tilt does change over time. Polaris has not always been the north star (once it was Thuban), nor will it always remain so. Otherwise, an excellent presentation. The diagrams are very detailed and help me understand the way the Earth rotates and is tilted. The information is clearly explained though some what technical for me. Teaching elementary grades this information is good for my background, but much isn't necessary for the 1-5 grade students I teach. Teaching seasons can be very difficult.It is a very hard concept for students to grasp. Many times adults have forgotten the facts too. This resource gives accurate, in-depth information. Great diagrams that can be used in the classroom. There are links that address common student misconceptions, which are often the biggest hurdle in teaching this subject. There were critical thinking links of "what if's" regarding tilt and distance. Perfect for really getting the wheels turning in the students' heads. I didn't give five stars because I thought there could have been better diagrams and activities for the students that could be more exciting. This resource is beneficial in understanding the science behind the Earth's seasons. The content of this resource is relevant to children and can be related to their real-life experience. Overall, I really liked this link on Earth’s Seasons. The information given covered a great deal of information; however it was concise and easy to understand. The pictures were great. They helped a lot with understanding how we get our seasons by the earth’s tilt and rotation. The built definitions were a great source and helpful to understanding the material, although I wish the definitions were on the same page as the material. This would help create a better flow instead of having to go back and forth. This is a great source of information for teachers. I learned a lot about the changing seasons that I don’t remember learning in school. It was a great refresher course to me. I always assumed the Earth’s position in its orbit around the Sun determines when seasons occur and it was interesting to learn that it does not. It also surprised me that Earth is farther away from the Sun in June. The assumption is that the closer the sun is to the Earth the warmer it will be, but it is really about how the Sun’s energy is delivered to the Earth’s surface. The “what if the earth wasn’t tilted?” question was also a very interesting fact. I learned that there would be more extreme weather at the equator and the North Pole and humans would be crowded into certain livable areas. In general, I found this site to be a wealth of information. The pictures and the animation were great ways to connect material that is hard to understand. It helped solidify a lot of information. I think the quizzes at the end of each section and at the end of the site was a great way to check what you have learned and hold you accountable for your knowledge.